Change is planned for the Martha’s Vineyard Museum, and the museum wants community feedback. That was the thinking behind a series of community forums recently held in Chilmark, Vineyard Haven, West Tisbury, Edgartown and Oak Bluffs. 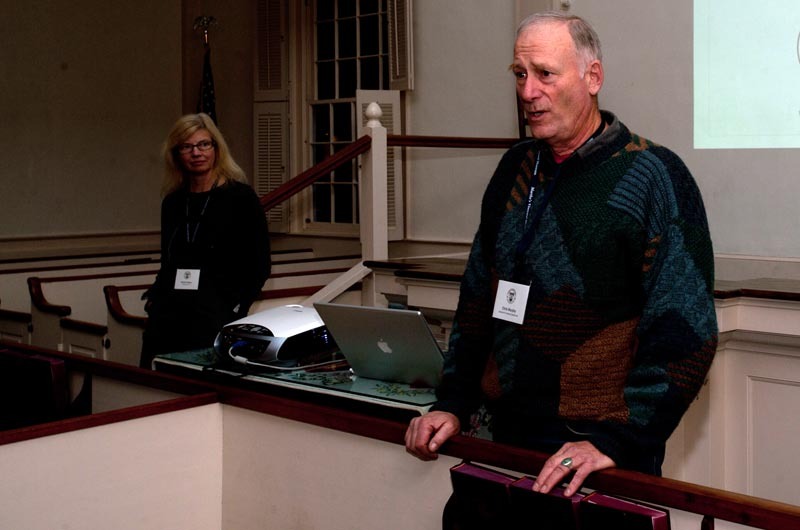 Speaking to a crowd of two dozen people attending the Tuesday night meeting at the Federated Church in Edgartown, museum executive director David Nathans thanked everyone for coming. “It’s important to all of us that we get feedback from you. We really, really want feedback,” he said. Absent from Tuesday’s meeting was the architect from Oudens Ello Architecture, but Mr. Nathans spoke on his behalf. Mr. Nathans and Bonnie Stacy, chief curator at the museum, spoke for 35 minutes about the organization’s history, the current physical condition of its campus and financial status, and the future plans of the move from School street in Edgartown to the former Marine Hospital on Lagoon Pond Road in Vineyard Haven. Ms. Stacy said that change is nothing new to the museum. “We started in 1924 as the Dukes County Historical Society,” she said. In 1996, the society changed its name to the Martha’s Vineyard Historical Society, and then again in 2006 renamed itself the Martha’s Vineyard Museum. “The reason for the change from the historical society to the museum was because ‘historical society’ was sort of like a club. You know, like, these are our things and we’ll share them with you on our own terms. And so, because we wanted to share with everyone, the name was changed,” Ms. Stacy said. Seven years later, museum innovations consist of more than a name change, but the idea of sharing the museum with the community remains. “We do a lot at the museum and one of the main things we do is put on exhibitions. What we are trying to do more of is use the expertise of community members to put on more exhibitions.” Ms. Stacy said. For example, she cited the successful Martha’s Vineyard Striped Bass and Bluefish Derby exhibit this year titled One on the Line. “We had the derby people helping us and Janet Messineo’s taxidermy fish on the wall. It was great and we got to work with the community,” she said. A bigger space for exhibitions will bring more opportunities like this to the community, museum leaders said. It will also allow more storage space with better conditions. Ms. Stacy said another drawback to the current space is the need to use the library as a multifunction space, for meetings, school groups and lectures. “Sometimes these things bump into each other and so we have to reschedule or redo them,” she said. The move to Vineyard Haven will solve the space problem, as well as a number of other issues, like parking. “Parking is a problem,” Ms. Stacy said. The crowd nodded their heads. “We want people to say, ‘Oh! Let’s go to the museum,’ not ‘there’s no parking, let’s not go,” she said. Ms. Stacy and Mr. Nathan used a slideshow to illustrate current and projected visions of the museum. Mr. Nathans pointed out a plan that showed a big open gallery space divided into sections. He said the goal is to create a “campus-like atmosphere” that still respects the 1895 building that once served as a marine hospital and later a summer camp. Plans call for the building to open as the new museum in 2017. Mr. Nathans concluded his presentation with a financial breakdown of the $22 million needed and the funding sources the museum currently has and is anticipating. Board member Chris Murphy joined Mr. Nathans and Ms. Stacy at the front of the room for the question-and-answer segment. Discussion ranged from food service to fundraising. Gina Stanley, owner of the Art Cliff Diner in Vineyard Haven, less than a mile from where the new museum will be, asked about food service plans. Ms. Stanley said catering opportunities would be an option and that renting out the property would be a smart way for the museum to make money, which shifted the conversation to fundraising. “The next stage of fundraising will be private individuals for large gifts — five, six, seven figure gifts — and that will set the tone for what we can expect,” said Mr. Nathans. “What about dinners? The Y had dinners and different Island chefs donated food and they were successful,” said Ms. Stanley. Mr. Nathans nodded in agreement. Ed Rodgers raised his hand to speak. “Two things: thank you and bragging rights. Thank you to the people who have spent many hours on this, thank you for all your meetings and all your work. Thank you.” There was applause. Oak Bluffs resident Bill McGrath asked the final question, bringing the discussion back to the beginning. “One thing that resonates in this presentation, other than the fact that we are all here, is that it sounds to me liket the fundraising is building the society that you talked about in the beginning, the club, the society,” Mr. McGrath said. “I would like to see more effort, and I’m sure you’re thinking about it, but I would like to see more effort by getting the little people that don’t have the five, six, seven-figure donation potential to contribute their one buck or five bucks or 10 bucks and then eventually own part of it too. Simultaneously, not sequentially after the little fundraiser dinner parties for the wealthy,” he added. “Yes. That is why we are having these meetings,” said Mr. Murphy. Mr. Nathans later reflected on the forums.